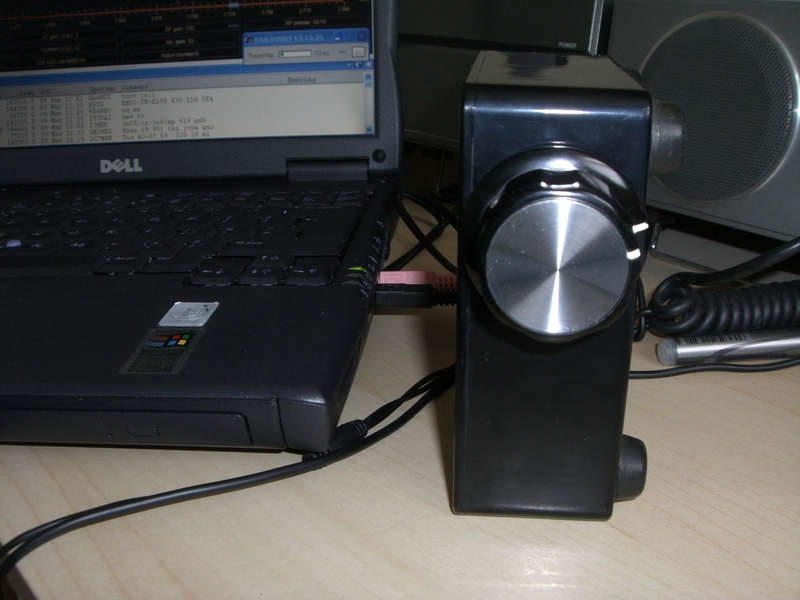 I have used a number of different PC programs to control my FT-847 and TS-2000 transceivers and the one thing that I found I missed when driving the rig remotely was a conventional tuning knob. Yes, the mouse could be used to click on a frequency or by using a combination of the buttons and moving the mouse or scrolling with the wheel I could tune across the band, but to me it just didn’t feel right. 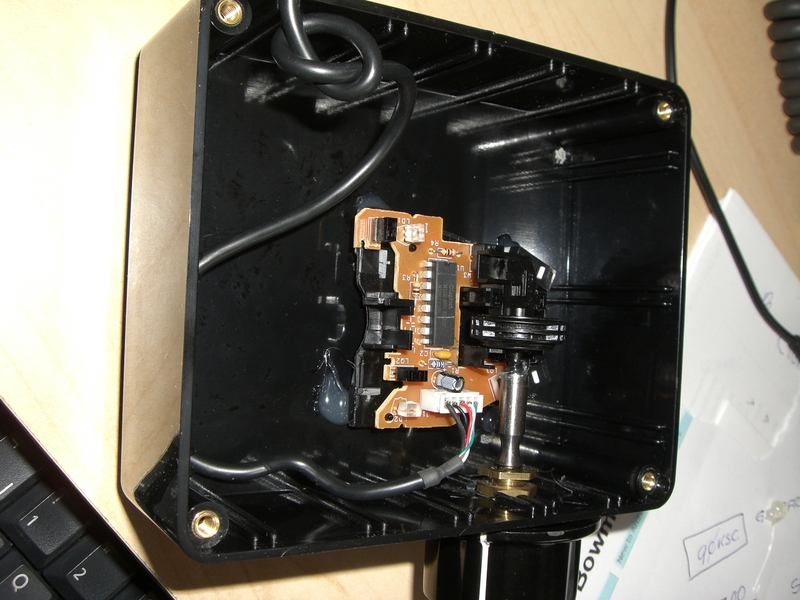 One day it occurred to me that if I could possibly attach a spindle and knob to the rotary encoder / wheel of a mouse it might make a simple and very cheap “conventional” tuning control. I make no claims for originality as I have seen this idea elsewhere on the Internet. I had a number of old USB mechanical roller-ball mice in the junk box, these had all been replaced with newer optical devices so they really had no further use… but this was to change. The upper casing of the mouse was removed, along with the hard rubber tracker ball. The plastic base of the mouse was also reduced to a smaller size, taking great care not to touch or damage the mouse printed circuit board. Electrically the mouse was untouched, the original USB lead, internal connections etc. all remained exactly as they were. 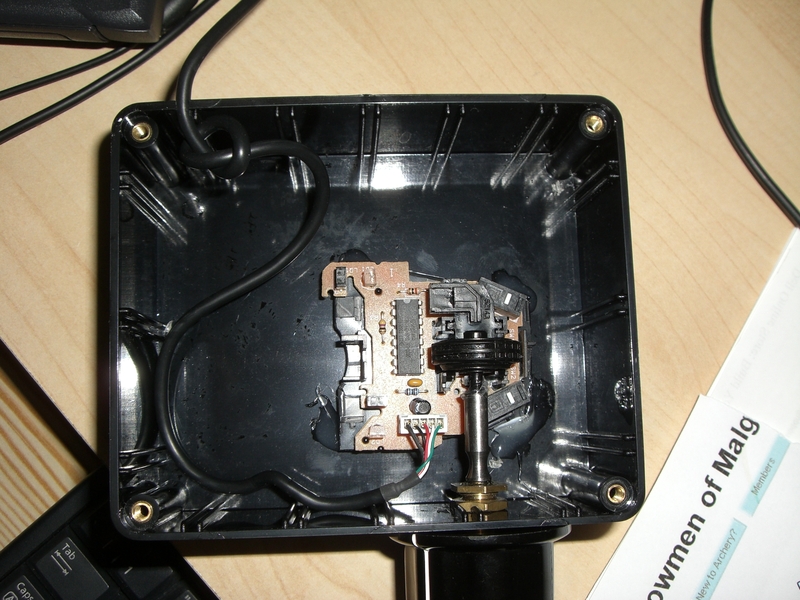 To rotate the mouse wheel a standard 1/4″ drive shaft and large tuning knob were needed. They were fitted as shown in the photos. The following photo, taken at an angle, shows the mouse base glued in place. I found that the tuning control worked really well, it did however tend at times to skate across the operating desk as there was no real weight to the unit. To overcome this a heavy weight was glued in place inside the plastic enclosure. The USB tuning control works really well, it is used in addition to a normal mouse. It is in effect working in parallel, so once the mouse pointer is positioned on the tuning dial using the standard mouse, the tuning can then be done using the new “conventional tuning knob”. I should point out that I have not opened up different makes of mouse to see how much they vary in construction. The first one I selected was ideal for my intended use as the roller wheel spindle was plastic, there was plenty of clearance for the shaft and no danger of any electrical or physical contact between the new spindle and any of the mouse circuitry.